The Anatra bench is made of solid ebonized walnut and incorporates steel and felt details. 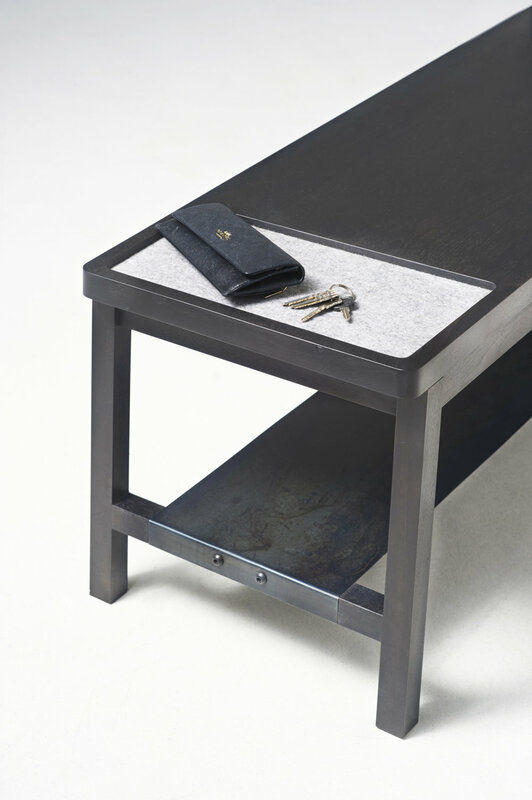 The bench features an inset panel of felt on the surface to place everyday items that may scratch a wood surface. Below the seat, which comfortably accommodates one but can easily seat two, is a blackened steel shoe rack with a rigid structure beneath which allows for the rack to appear thin and delicate but obtains strength and lack of flex in the material. The bench also features a shaped arm rest and seat edge detail. The radius of the arm rest and end grain of the seat is satisfying to the touch and accommodates the form of the hand very well.